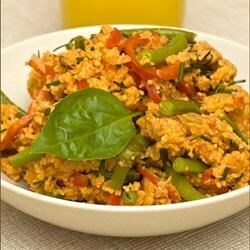 "Couscous doesn't have to be plain or even an accompaniment to something else. This vegan dish proves that. It can be eaten on its own or with a salad. It's fragrant, filling, and full of spices that are bound to please." Heat canola oil in a saucepan over medium heat. Add onion and garlic and cook until softened, about 2 minutes. Stir in cumin, coriander, salt, and cinnamon stick; cook 3 minutes. Pour in vegetable stock and tomato sauce. Bring to a simmer. Remove from heat. Stir couscous into the saucepan; cover and let sit until couscous is cooked through, about 10 minutes. Remove the cinnamon stick; sprinkle cilantro on top. You can choose to add basil and vegetables, such as green beans and fresh tomatoes, if desired. Vegetable stock may be replaced with chicken stock.